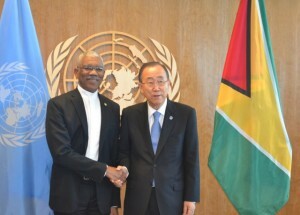 President David Granger and United Nations Secretary General, Ban Ki Moon. United Nations (UN) Secretary General, Ban Ki Moon has given himself until November to assess the next step in dealing with the Guyana-Venezuela border controversy, even as the Granger-led administration continues to push for a settlement at the World Court. “I have to make a assessment by November” the Ministry of the Presidency quoted Ban as remarking in talks with President David Granger at the UN Headquarters in New York. Secretary Ban Ki-moon will demit office on December 31. President David Granger, during the meeting accepted this timetable and committed to providing any additional information, which Mr. Ban Ki-moon may need in order to complete that assessment. UN teams have already visited Caracas and Georgetown on behalf of the Secretary General. The Head of State thanked the Secretary-General for his efforts. “We have been very impressed with the seriousness with which you have approached the problem and your own sincerity… We have been personally convinced that you want to bring closure to this matter,” he said. Also attending the meeting on behalf of Guyana were Minister of Foreign Affairs, Mr. Carl Greenidge, Sir Shridath Ramphal, who was present at the signing of the Geneva Agreement in 1966 between the United Kingdom, on behalf of the then British Guiana and Venezuela and Director General of the Ministry of Foreign Affairs, Ambassador Audrey Waddell. Guyana has maintained that the mediation through the UN Secretary General’s Good Officer process has not worked and it is now time for the Secretary General to exercise the next option available in the Geneva Agreement by referring the controversy to the International Court of Justice. President Granger, in an address earlier this week to the United Nations General Assembly, charged that Venezuela has been obstructing efforts by the UN Chief to refer the matter to the World Court. Guyana maintains that the 1899 Arbitral Tribunal Award is a full, final and perfect settlement of the border between the two neighbouring South American nations. Since the discovery of a huge oil reserve offshore Guyana, Venezuela has heightened its aggression by unilaterally extending its maritime boundary to include all of the Atlantic sea offshore Essequibo. At one time, Venezuela had massed soldiers near the land border with Guyana, a move that President Nicolas Maduro had told the UN General Assembly last year had to do with a counter-narcotics operation.